#AceBritishNews – BRITAIN – April 26 – Prime Minister Margaret Thatcher was warned a World War Two codebreaker had become a security threat 40 years after his “influential” work. Gordon Welchman’s team at Bletchley Park improved the Enigma code-breaking machine, widely credited as shortening the war by two years. Newly released papers show that in 1982 Mrs Thatcher was told of the threat when Mr Welchman wrote a book. The Hut Six Story included details that were “still classified”, she was told. 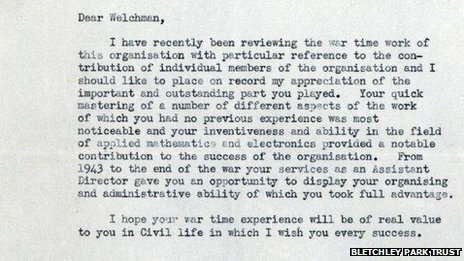 Cabinet secretary Sir Robert Armstrong’s memo to the Tory leader is among documents that have been given to the Bletchley Park Trust after being held in Mr Welchman’s son’s attic for 26 years. “The book goes into very considerable technical detail about the method developed for this work,” Sir Robert said. Mr Welchman, who died in 1985, devised a system to deal with thousands of messages a day sent by the German Enigma machine. The Cambridge graduate saw that the Bombe code-breaking machine needed enhancing and drew up a production line system which became the centre’s wartime working model. His biographer, Dr Joel Greenberg, said this had been “revolutionary” and made him one of the centre’s “most important figures”. In 1941, Mr Welchman and four other men known as The Wicked Uncles – including Alan Turing – personally delivered an influential letter to Prime Minister Sir Winston Churchill asking for more resources for Bletchley Park. 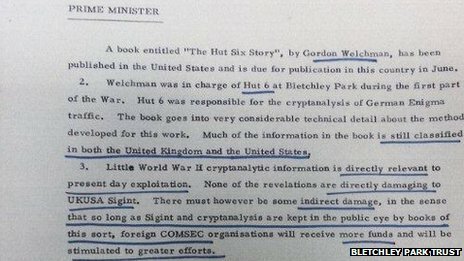 Mr Welchman then became the head of Hut Six, which was responsible for breaking German Army and Air Force Enigma ciphers, and was the first to detail the work of the code-breakers in his 1982 book. The book was not banned but Mr Welchman lost his US security clearance and was forbidden to discuss his book or his wartime work, with the media. Three years after its publication, a letter was sent from GCHQ Director Sir Peter Marychurch accusing Mr Welchman of damaging security. The trust said the documents and possessions would help tell the story of a man whose work was “crucial” to Bletchley Park’s success but of which “most people have never heard”. 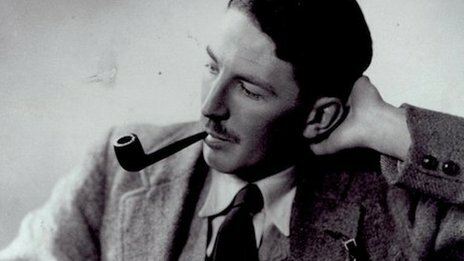 Question: Churchill knew that at least one person working at Bletchley Park was also a spy for Stalin. Have you any data on that? Perhaps in the UK there is more interest or a common knowledge? I have read, it was the reason why Churchill ordered Ultimate dismantled and parts removed, and some parts shattered to bits, as it was known that Stalin had a steady flow of information via his own espionage efforts, and somebody inside, of Bletchley Park. Riveting! It is now known that at least one member of Bletchley Park was a spy, who passed information on to the Russians. While the allies were giving Russia edited information, Stalin distrusted it, and preferred the Park’s Agent Liszt, and his information proved vital at the Battle Kursk, while also risking giving away to the Germans Bletchley’s success. MOSCOW – George Blake, a former British spy who doubled as a Soviet agent, has spoken about his career with pride and called himself an “exceptionally lucky man” in an interview published in a Russian government daily Tuesday. Blake, who will turn 90 Sunday and has lived in Russia since his escape from British prison in 1966, told the daily Rossiyskaya Gazeta that he has spent his “happiest” years in the country. “When I worked in the West I always felt a looming threat of exposure. Here I felt myself free,” he is quoted as saying. Wonderful information, most unavailable here. Did not know that Bletchley Park was 55 acres. I had two teachers that were from London, my second grade teacher told the class o the 1940 London Blitz when she was a girl. From that time, I started asking about the war, which angered my father, who went from D-Day to VE Day with 82d Airborne. It also explained why, I have to stop and correct myself to American English when at times I will go to British English. She said, there was concern of spies being all over and a fear that caused people to report anyone for anything amiss. Her family had to vacate to somewhere else as her home was destroyed and someone found an unexploded bomb inside of the building. The high school teacher only tightened his jaw and ignored questions about it. We did have another two teachers, one targeted by the American Bund to be killed, because he found a device that he defused and taught students how to do the same. They were then assigned to Floyd Bennett Airfield and the students defused a number of Bund devices. That teacher had a finger blown off when something went off as he removed a primer, and he showed us the newspaper page with the story. The last of those teachers mentioned, said that he was a distant relation of Churchill’s American family and that, was how he ended up a teacher. He taught, History. On the ULTRA aspect of the information, I had spoken to three people that knew as acquaintance, Fritz Lemp, the skipper of U-110. He was not a member of the Nazi Party because you could not be in command of any military unit if politically connected, because Hitler feared an Coup de Eta. Lemp had angered British navy personnel by scuttling the U-110, then stiff arming and going below in defiance of a verbal surrender order. That was the reason why the commando shot him as he feared Lemp was a mad dog Nazi. Cremer, Hardigan, and Topp, all said the same thing when I spoke to them years ago. I noticed something else immediately, the U-boat commanders could do intricate mathematic calculations in their heads and solve problems instantly, which is also a necessary and vital skill of cryptology, and that was why, I had wondered who, would pass along sensitive and secret information, when they are smart enough to know, it is wrong and odds (math) are (fact), they would be caught and charged with treason. I could spend the next 20 years absorbing the whole topic and enjoy every moment of it. Great reply as usual and agree about sensitive information, but really interesting subject to research.